At a time when President Barack Obama has likened his new military strategy in Iraq and Syria to his drone programs in Yemen and Pakistan, disturbing new information has surfaced that damn drone strikes as indiscriminate in their effect on non-combatants and probably constituting war crimes. After a lull in drone strikes in Pakistan—marking what some thought was the beginning of the end of attacks in Pakistan—the United States has amped up attacks this month. Regarding one attack on October 7th, Reuters reported “at least 8 suspected militants” were killed; the New York Times and Washington Post republished Associated Press reports, which quoted an “official” saying “at least 10 militants” were killed. According to the scenario framed through media reports, U.S. counter-terrorism operations in Pakistan are successful. But this is a distorted perception. A comprehensive investigation by The Bureau of Investigative Journalism found that only 12% of those killed in Pakistan by drones over the past ten years were militants. Al Qaeda members—the original intended targets of the drone program—constituted only 4% of those killed. Civilians aren’t just collateral damage, they are the overwhelming victims of drone strikes. It’s a major challenge to a government who repeatedly insisted that drone strikes occur with “surgical precision”. Now that the U.S. is repeating the program in the Middle East and Somalia, we need to be able to understand just how effective drone strikes are, not just in eradicating terrorism, but simply killing terrorists. What makes TBIJ’s estimates unique is that it went through the laborious process of identifying the dead through open-source reports and leaked Pakistani government reports. This isn’t possible for media who have to report events immediately. Out of 2,379 victims, TBIJ has identified 704 so far. Of those, they found that only 295 were militants and 84 were Al-Qaeda fighters. These numbers are staggering. 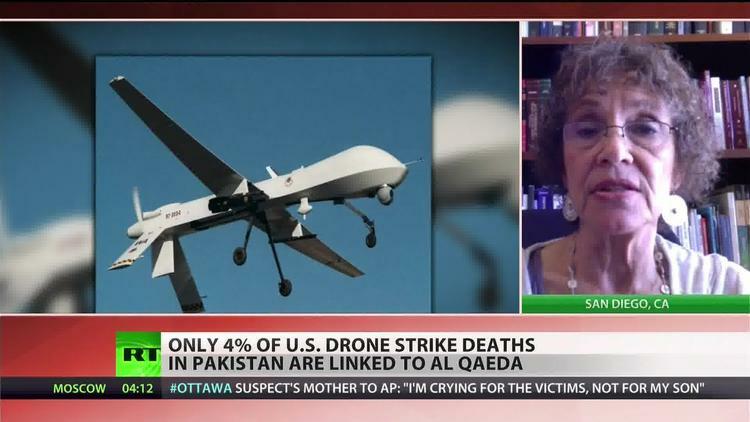 If we take the total as the base, then effectively, nearly nine in ten people that U.S. drones have killed in Pakistan were not part of a militant group. Compare TBIJ’s findings to numbers from New America Foundation, another reputable organization that has been diligently tracking drone strike victims. NAF offers estimates of victims killed in ranges. For example, they calculate the total to be 2,169-3,539. Calculations based on the higher number in each range find that militants made up nearly 82% of those killed—significantly higher than TBIJ’s 12%. Even if we compare this to the ratio of militants (295) to just identified victims (704) in TBIJ’s database, militants still make up only 40% of victims, half as many as those suggested by NAF. Why such a huge difference? NAF’s estimates are based solely on media reports, which often have to rely on U.S. officials for information. Journalists have little access to Waziristan and the CIA offers limited information about attacks and their victims. But such limited information is dangerous: the U.S. is using media to distort the perception of the effectiveness of drone strikes, to make them appear as a viable alternative to “boots on the ground” to battling terrorists. The discrepancy between TBIJ and NAF’s numbers underscore just how big a blind spot the U.S. drone program is in media and public knowledge. It’s not difficult to ascertain how we might be killing so many civilians. A 2012 New York Times report revealed that under his drone program, President Obama’s “kill list” effectively considers men of military age as legitimate targets. So, the U.S. can theoretically be hitting targets with “near precision”, if those targets are simply young men. We also know that the U.S. government will consider victims civilians if there is “explicit intelligence posthumously proving them innocent.” But there is little incentive to prove their innocence. U.S. doesn’t have boots on the ground in Pakistan. Waziristan is a remote area with a strong presence of militants, and unsecure for reporters. The Pakistani government has a vested interest in keeping U.S. operations in Waziristan going, but it doesn’t like admitting its complicity in drone strikes. When there is no one looking, it’s easy to cover up the aftermath. We just have to take the government’s word that those killed are “bad dudes”.